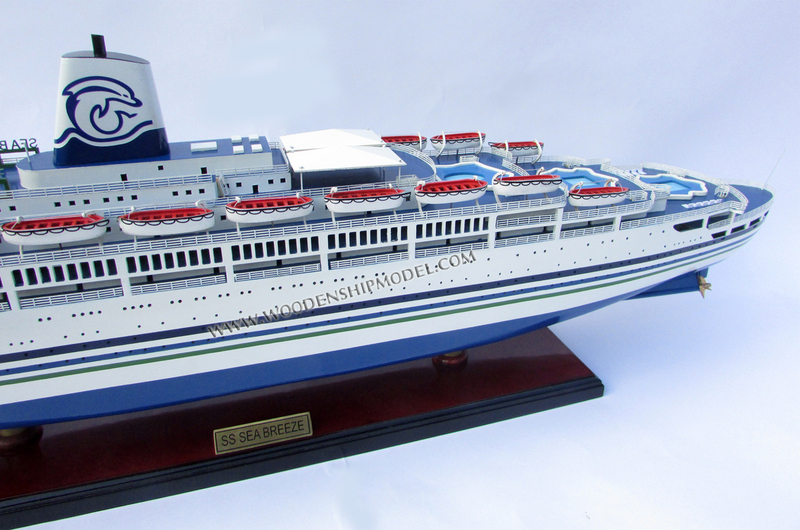 Our model is hand-crafted from wood with planks on frame construction and painted as the real ship without any plastic material. Model is ready for display, not in kit form. Model includes the base and a brass name plate. 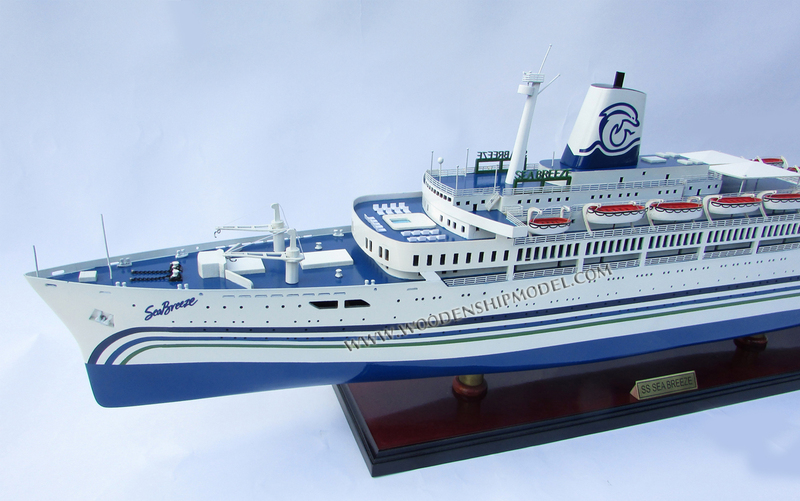 This ship was built in 1958 by the Ansaldo Sestri Ponente shipyard in Italy as the Federico C. The ship was the first new ship built for the Costa Line. The ship was initially liner service between Genoa, Italy and Buenos Aires, Argentina via Rio de Janeiro, Brazil. In 1966, she began service between Genoa, Italy and Florida, the Caribbean and Venezuela. The ship had a major refit in 1968, then added Caribbean cruises between trans-Atlantic trips. 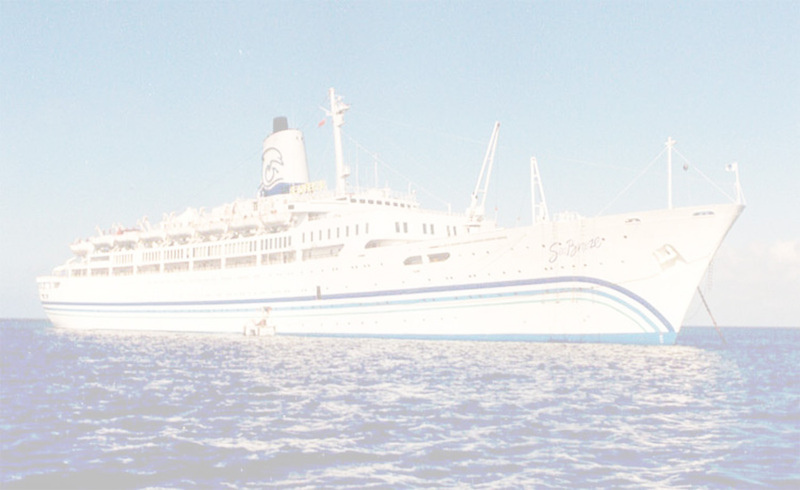 Federico C did cruises exclusively from 1972 to 1983, when the boat was sold. In 1983, Premier Cruises obtained the ship and named it the Royale; it became the StarShip Royale' in the same year. 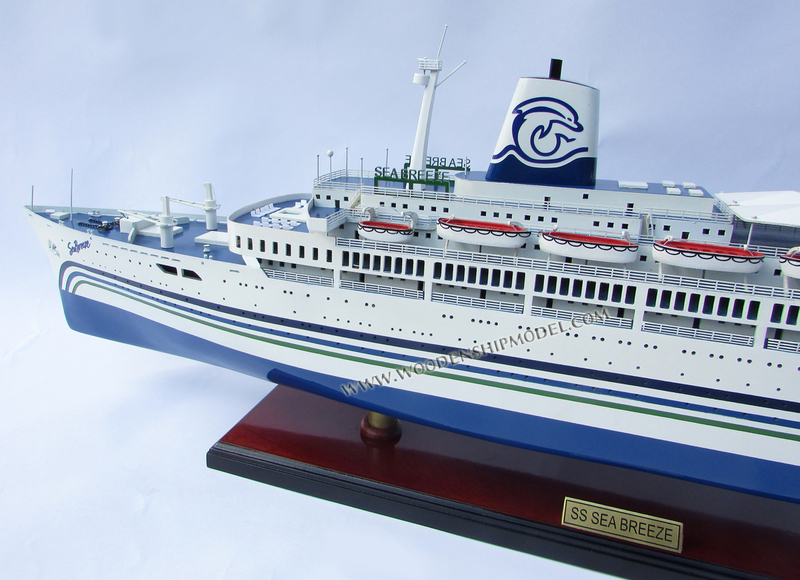 In 1988, the ship was renamed the SeaBreeze when it was placed in service for Dolphin Cruise Lines. One year later, the ship was refurbished. 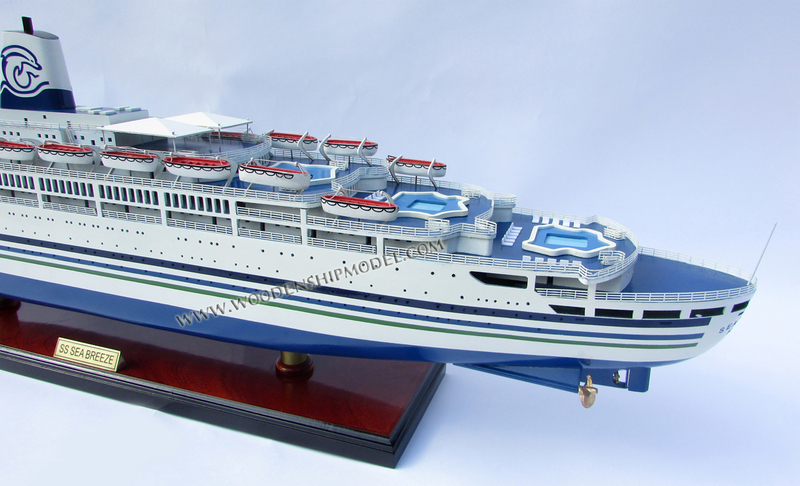 Premier took possession of the ship when it acquired Dolphin in 1997. When Premier went out of business in September 2000, the ship was ordered to immediately cease operations. At the time, it was docked at a Canadian port. In December 2000, it sank off the coast of North Carolina/Virginia. when the ship's boiler allegedly broke off and damaged the ship. The investigation into the sinking of the SeaBreeze I caused international concern, based upon numerous suspicious incidents, including the fact that the ship was likely to fetch only between $5 and $6 million for scrap, but had a $20 million insurance policy on it. The cruise ship sank in international waters flying the Panamanian flag, making Panama responsible for the investigation of the sinking of the boat. The ship's captain told U.S. Coast Guard rescuers that his boat was in imminent danger of sinking as a result of its engine room being flooded in high winds and 25-foot seas. At the time, the Coast Guard rescuers believed that it was highly unlikely for a ship that large to sink that quickly, and were astonished when the Greek captain demanded that all hands be extracted from the ship, instead of requesting salvage tugs and trying to tow it to shore for recovery. Subsequently, all 34 crewmembers were rescued; there were no passengers on board. At the time of the sinking, Steven Cotton of the International Transport Workers' Federation in London stated that he wished that the ship, which went down 225 nautical miles (417 km) off the Virginia coast, had gone down 25 nautical miles (46 km) closer to the coast because that would have put the case in the hands of American investigators. According to Cotton, "Panama's track record of carrying out comprehensive investigations into vessel sinking is not very good." The vessel had just been purchased by Cruise Ventures III, a subsidiary of New York-based DLJ Capital Funding and was traveling from Halifax, Nova Scotia to Charleston, South Carolina.